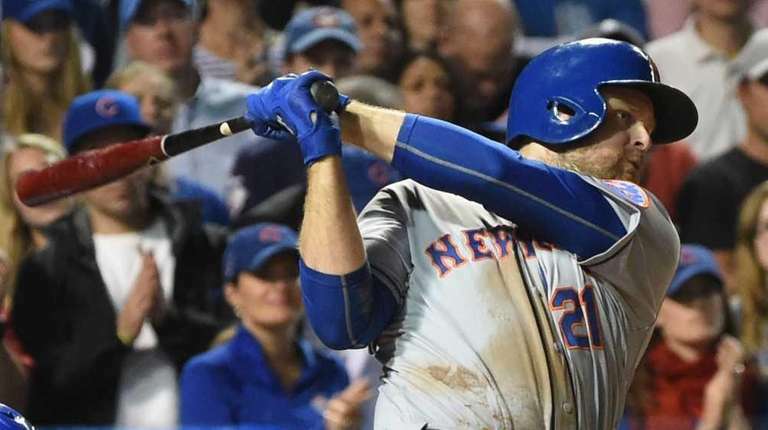 CHICAGO - Lucas Duda broke out in a big way Wednesday night. The slumping first baseman, who was hitting so poorly in the postseason that he bunted on Tuesday, had five RBIs in the first two innings of Game 4 of the NLCS against the Cubs. Duda hit a two-out, three-run home run to center off Jason Hammel in the first inning on a 3-and-2 pitch. Travis d'Arnaud followed with a home run to right and the Mets had a 4-0 lead as they looked to sweep the Cubs to get to their first World Series since 2000. It was the second instance of back-to-back home runs in Mets postseason history. Darryl Strawberry and Kevin McReynolds did it in the fourth inning of Game 4 of the 1988 NLCS vs. the Dodgers. The Mets sent nine men to the plate in the first. Ward Melville's Steven Matz, the Game 4 starter, batted before he threw a pitch. The Mets have scored in the first inning in all four games against the Cubs (total of nine runs) and also scored one run in the first inning of Game 5 of the NLDS against the Dodgers. Duda's home run was his first of the postseason. He came in with three hits in 24 at-bats (.125) with one RBI and 13 strikeouts. Duda was benched in NLCS Game 1 in favor of Michael Cuddyer against lefthander Jon Lester. Duda also hit a two-out, two-run double off lefthander Travis Wood in the second inning to give the Mets a 6-0 lead. Duda's five RBIs in the first two innings tied the franchise record for a postseason game. Curtis Granderson had five RBIs in Game 3 of the NLDS. Duda grounded out in the fifth. In another RBI situation in the seventh with the Mets leading 7-1, he walked against righthander Pedro Strop. Other than in Game 1, manager Terry Collins has stuck with Duda in the fifth spot in the batting order. Duda has a history of getting very hot when he gets going. His batting-practice sessions in the two days at Wrigley Field have included massive home runs. Wednesday night, he did it in the game. "There's some things he's got to get settled, get quieted down, to get himself in a better hitting position," Collins said on Tuesday. "That's the things they've been working at. He goes in and out of it. All of a sudden he gets himself in a better position at times and gets red hot."